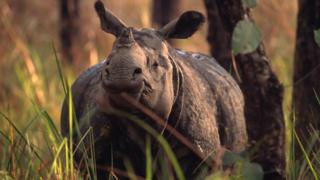 Image caption An Indian rhinoceros seen in Chitwan National Park, Nepal. Poaching, illegal logging and fishing are threatening endangered species in some of the world's most iconic natural sites, according to a report. Conservation charity WWF says almost half of the world's 200 designated natural heritage sites are "plagued" by wildlife criminals. These include the last refuges for critically endangered javan rhinos and wild tigers. The authors say more co-ordination is needed to target the whole crime chain. From the Great Barrier Reef to the Galapagos Islands and at many other locations across the globe, Unesco has designated around 200 natural World Heritage sites as being of outstanding international importance and deserving of the highest levels of protections. WWF looked at the threats to species that are already protected under the Convention on the International Trades in Endangered Species (CITES). The authors found that these threatened animals and plants are poached or illegally harvested in 45% of natural World Heritage sites. Many of the parks in the study are home to critically endangered creatures - including Ujung Kulon National Park in Indonesia, which is the last stand for around 60 javan rhinos. The Okavango Delta World Heritage site in Botswana is a key location for elephants in the north of the country, which make up almost a third of all remaining African elephants. Image caption Selous Game Reserve in Tanzania is one of Africa’s largest wildernesses. But in 2014, it was put on the Unesco list of World Heritage sites in danger, mainly due to increased poaching. "You have got the world's most cherished species on the one hand, and on the other the world's most cherished sites, they are inextricably linked," said Dr Colman O'Criodain from WWF. "Of course there's the economic value of these sites, but these are special places, they give you a lump in your throat when you see them and if we really want to cherish these we all have to step up." Between 1970 and 2012 global wildlife populations declined by almost 60% on average. According to the report, what's going on here is not just unsustainable practices in fishing and logging, but criminality. The illegal trade in species is said to be worth around £15bn ($19bn) a year, with the unlicensed timber trade said to be responsible for up to 90% of deforestation in major tropical countries. Over a two year period, the illegal rosewood trade in Madagascar has cost locals up to $200m in lost income. Image caption A young tiger captured by camera trap in Bukit Betabuh Protection Forest, Indonesia. Like many other locations, simply designating an important site as part of world heritage, isn't enough by itself to stall the criminals. "In the case of Madagascar there is a lot of corruption and weakness of government on their side and there is complicity among highly placed people in what is going on but support from importing countries and the wider international communities will help a lot," said Dr O'Criodain. 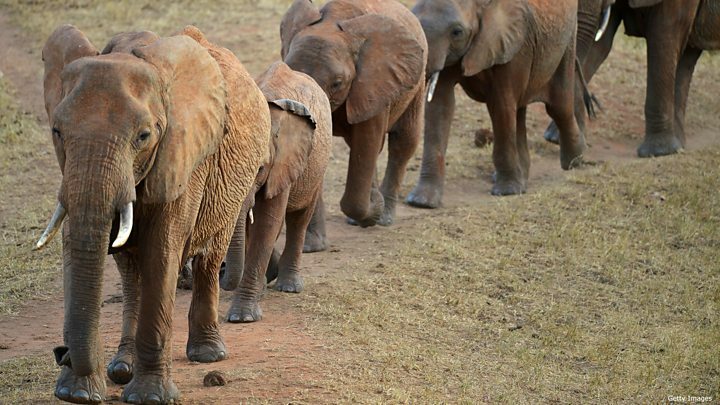 The report points out that the illegal trade in species at natural heritage sites is having a significant impact on people's livelihoods as the disappearance of rare animals and plants can deter tourists. In Belize, for example, more than half of the entire population are supported by income generated through reef tourism and fisheries. There is also a more direct and deadly human cost in terms of lives lost, with at least 595 park rangers killed protecting key sites between 2009 and 2016. Current approaches to stemming illegal trade are just not working, the study concludes. It suggests that rapidly increased co-operation between CITES and the World Heritage Convention could help turn the tide. "This report provides a range of options to further enhance co-ordination between CITES and the World Heritage Convention, focused around World Heritage sites," said John Scanlon, Director General of the trade convention. "It is essential that CITES is fully implemented and that these irreplaceable sites are fully protected. In doing so, we will benefit our heritage and our wildlife, provide security to people and places, and support national economies and the rural communities that depend on these sites for their livelihoods."